Samsung Electronics Singapore today announced that it will be the first in Southeast Asia to make Samsung Pay available beginning on June 16. Secure and easy-to-use, Samsung Pay can be used to make purchases almost anywhere1 that debit cards or credit cards are accepted. In fact, Samsung Pay is the only mobile wallet that allows users to pay with their compatible Samsung smartphones at terminals that accept contactless payment as well as those that do not accept contactless payment. 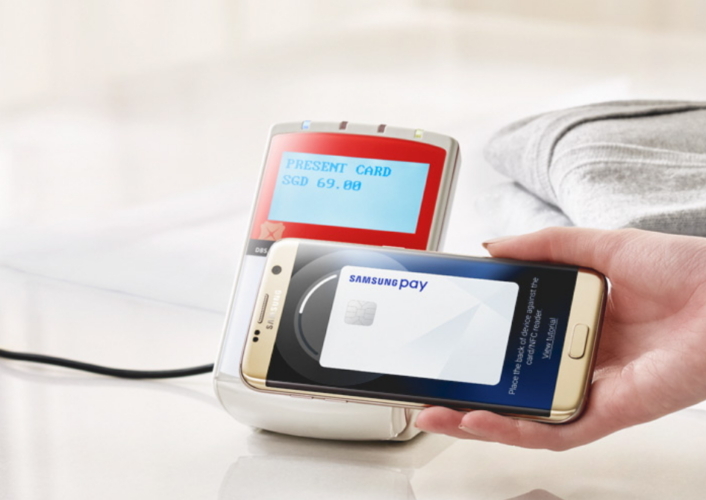 “We are extremely excited that Samsung Pay is now available in Singapore. As the first market in Southeast Asia to roll out our mobile payment service, Singapore will pave the way for the region’s adoption of Samsung Pay,” said Stephen Suh, President, Samsung Electronics Singapore. Samsung Pay is continually expanding its partnership ecosystem to provide greater flexibility, access and choice for customers in Singapore. Currently, Samsung Pay has partnered with major payment networks such as American Express3, MasterCard and Visa, and major banks such as Citibank, DBS/POSB, OCBC Bank and Standard Chartered. Additionally, Samsung and Singtel will be exploring potential collaborations in the mobile payment space. At launch, Samsung Pay will be accepted at the vast majority of merchants, wherever MasterCard or Visa is accepted, and is not limited to merchants that have updated to contactless terminals. Singapore consumers will be able to use Samsung Pay at their favorite popular chains, as well as thousands of independent shops. For merchants that have not yet updated to contactless terminals, Samsung Pay’s proprietary MST (Magnetic Secure Transmission) technology enables contactless payment on existing merchant terminals. SAFE: With each separate transaction, Samsung Pay uses an encrypted digital token to replace sensitive card information to prevent fraud. Your payment information is better protected than ever before. Transactions made on Samsung Pay require registered fingerprint or PIN for authorization, so you are in control when each payment is made. The encrypted fingerprint information is stored in a separate, secure area of your device. Samsung’s industry-leading KNOX security platform, which received the most “Strong” ratings of any mobile security platform for Corporate Managed Security5, provides real-time kernel protection and monitors malicious software and activities on your device for added security. ALMOST ANYWHERE1: Samsung Pay is accepted almost anywhere you can swipe or tap your credit or debit card. By incorporating Samsung’s proprietary MST technology, together with NFC (Near Field Communication), Samsung Pay will be compatible with the majority of existing and new payment terminals, allowing users to pay with their compatible Samsung smartphone almost anywhere. Thanks to MST, Singapore users can also use Samsung Pay for transactions above $100. Samsung Pay is an example of how Samsung continues to push the boundaries of hardware, software and services to create devices that are designed to improve how consumers connect, share, organize and get more out of life. The company is redefining what is possible, beyond the limits of today’s technology, by introducing a constellation of seamless mobile experiences to bring added flexibility and convenience to consumers’ lives. Samsung Pay will be available on the Samsung Galaxy Note 5 4G+, S6 edge+ 4G+, S7 4G+ and S7 edge 4G+ beginning on June 16 in Singapore. 1 Availability almost anywhere is based on compatibility of Samsung Pay on MST and/or NFC payment terminals, with some supported for use only after software upgrades. Samsung Pay is exclusive to selected Samsung Galaxy smartphones only, and available across all participating payment networks, banks, and merchants. Availability may vary, please check for updates. 2 Most NFC terminals currently accept payments up to $100, while there is no limit on payment transactions via MST terminals (subject to a cardholder’s credit card limit).